ZeroZero is a Drum & Bass duo consisting of Sam from Jersey and Jesse from London, both based in Amsterdam working as Audio Engineers, Producers and DJs. 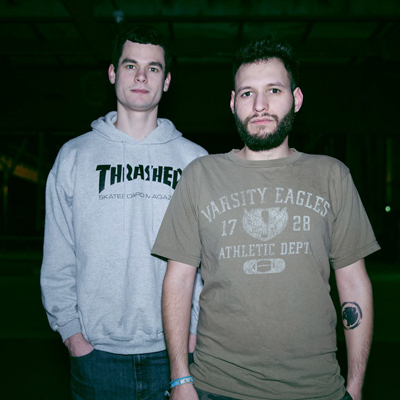 With releases on labels such as; Evol Intent Recordings, Mindtech Recordings, Liondub, Soul Rebel and DJ residencies at Cheeky Monday and Vanguard Audio, as well as positions as Head Engineers at Amsterdam’s Red Bull Studios, the pair are constantly working on several different musical projects at once. Currently working closely with the bass prodigy Teknian, they have a number of tracks lined up for release in 2016 along with collaborations with other exciting producers that have yet to be revealed. Supported by artists such as Reso, Spor, Evol Intent, JFB, B Traits, Bachelors of Science, Dave Owen, Calculon, Champion, Skandandbass, Adi-J and receiving plays on BBC Radio 1 and 1xtra, ZeroZero are writing music that appeals to fans of all the various DnB sub-genres. Their sound is heavily influenced by their love for funk, deep basslines and technical sound design as well as the musicality you’d expect from a duo with a background in playing live instruments. ZeroZero have big plans for 2016 with releases forthcoming on labels such as ProgRAM, Broken Audio, Bass=Win and Code Recordings, forthcoming sample packs for Prime Loops, and shows booked in Holland, UK, USA, Mexico and Canada so far. Their 4 deck DJ sets are fast paced, combine all styles of DnB and are packed with their own exclusive tracks, bootlegs and edits, making them an exciting addition to any lineup.